​Go to our Events Page for more information on important upcoming dates! 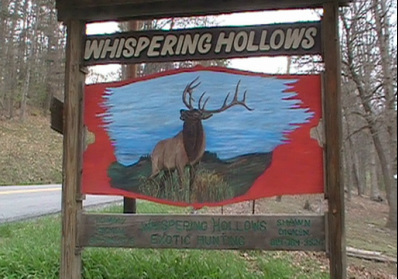 Whispering Hollows Hunting Preserve is a private family-owned business that strives to provide hunters of all ages a hunting experience of a lifetime. Our preserve is found in the rolling hills of south-central Pennsylvania where we have four beautiful seasons and 500+ acres enclosed in high-fence. We have a large variety of animals native to this area and many choices for exotic hunts. We mix the serene atmosphere of the woods with down-home country charm to provide a fun and enjoyable experience for all involved. We work with our hunters to get the type and size of animal that is desired and/or stay within specified budgets. If you desire the wide-open hunting experience found outside of the preserve, we also offer guided hunts outside of the preserve. Browse our website for more information on animals, rates and lodging. If you have questions please do not hesitate to call or e-mail. Thanks for visiting our site and we look forward to hunting with you!